It's been a long two-and-a-half months since I loudly sighed with relief as the Metal Gear saga drew to a conclusion. And yet, it never really ended. Snatches of dialogue, snippets of onscreen magnificence still flicker brightly in my mind. Set in a world that hauntingly parallels our own (or is that portent I sense? 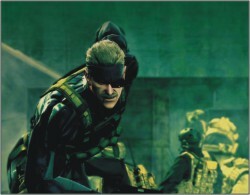 ), Solid Snake must once again save it from a maddening endless spiral of death and destruction. And the Metal Gears are only a small part of the plan. How's that for impetus? However, this is not the same Snake we know. Now coiffed in silver, ashamedly revealing hardened arteries and weakened muscles, this is a warrior possessing everything but time. As his lifespan draws to a close due to the effects of a certain virus, Snake must defeat his mortal enemy a freakish amalgamation of both Liquid Snake and Revolver Ocelot utterly. Poised as a sweeping tale of certain Epic (yes that's Gurren-Lagann-scale Epic; with a capital 'E') proportions melding consummate gameplay and presentation that superlatively assaults the senses, Metal Gear Solid 4 is an experience for the gaming ages. And I despise it for that. See, it's a game lovingly crafted with a level of minutiae that begs more than the initial exploration. It has a bit of everything: love, loss, pain, bewilderment, rage, laughter, sorrow and of course, face-slapping-jaw-dropping revelations. Some may be once suspected yet never expected. It's a game that answers questions that have accumulated over twenty years of legacy. It's also an emotional journey that brings together characters new and old for one last great adventure. That's just the story. Between the spectrum of silent, skulduggery and stealth and explosive, intense action, you can find a comfortable niche that's part shooting, part sneaking and all awesome. While the story drives you onwards, the game constantly surprises you five unique acts that run a gamut of gameplay styles, nostalic evocation and everything you've ever learnt from Metal Gears past. It's both homage and reinvention in a package that defies description; the attention to detail is astonishing. Working your way up from acclimatising yourself with the new, refined controls to using a combination of spy gadgets, organic hand-to-hand combat and nerve-wracking gun battles, the amount of choice is staggering. Linear the paths may be but no one ever said that your approach has to be. And the bosses? Okay, they fail as conglomerate units but taken separately, their macabre tales, somewhat innovative (bar a few) fights and thematic values offer much to obssess over. The eponymous Metal Gears are present in ways that will frighten you like no horror game can; these new Gekkou units combine speed, lethality and bloodcurdling sounds into a metallic package of death. They're not unlike the raptors from Jurassic Park. Given production values that raise the bar for all videogames (par for the course with any Metal Gear Solid game, really), it's a world that's all too easy to lose yourself in. You could also lose yourself trying to find some sort of weak link in this crazy chain but your search will end in futility. From animation to art direction to cinematography, the visual aspect stands as a culmination of director Kojima's film aspirations. Hollywood composer Harry-Gregson Williams matches the insane auteur's graphical insanity with a soundtrack that's as evocative as it is provocative. Ranging from the quiet, select guitar chords of Love Theme to the pulse-pounding Desperate Chase, there's a level of passion and variety that surpasses his work with previous Metal Gears. And for the fans there's the brilliant Metal Gear Saga theme which incorporates the themes from the entire series into a singularly rousing orchestral piece. And that's the problem. The game isn't just good. Or incredible. Or fantastic. It defies description in many ways, culminating in an experience that will leave you spellbound. After you've finished it, you know you've played something different, passing a point after which all other games seem to shine less in comparison. So there you go. Love it for the experience and hate it because it's the game that makes playing any other game less fun. It's got a few flaws but seriously, once you get immersed in a game, any game, do you really notice? Nope. Here's to Metal Gear Solid 4, a game for the ages. Champion of the popular show DRockstars-2, Powersurge released its debut 'Auprostut Juddho', one of the season's most anticipated albums, on the 28th of August at Russian Cultural Center, under the G-series label. With over three hundred people cramped into the small auditorium with about a few more hundred people waiting outside, the major event started off at 5.30 p.m. with a short press conference. The introductory speech was made by Chief Guest Hamin Ahmed (president of BAMBA) followed up by a few more speeches by Bassbaba Sumon, Mr. Khaled of G-series, Bonno Fuad and Powersurge members, Jamshed and Samiul. Djuice, GrameenPhone who are the sponsors of the album, also had their representative, Sajidul Islam, present at the occasion. Shortly after the press conference, the album was released as the entire crowd burst into a loud cheer. Next, the band performed on the songs 'Auprostut Juddho', 'Agnisnan', 'Cancer', 'Han'gor', 'Shesh Shimana', 'Powersurge' and 'Mithher Agrashon' from the album. They also rendered a cover of the Metallica song 'Creeping Death'. The sound system was exceptionally brilliant and the new songs seemed to take the crowd to a whole new level of enthusiasm. The show finally ended at 8p.m. and those who had managed to get in said that they had enjoyed the event immensely. Pity for the unfortunate people who never made it inside despite standing in queue. Powersurge undoubtedly has a huge fan following. Powersurge is basically a Thrash/Groove metal band with its members consisting of Saimum Hasan Nahian (Guitars), Golam Samir Hafiz Khan (Guitars), Jamshed Chowdhury (Vocals), Samiul Islam (Drums) and Ahmed Saeed Arefin (Bass). Their music is inspired by the old Metallica, old Sepultura, Lamb of God, Kreator and German/Western Thrash bands and American Metal. Powersurge is THE band everyone has been talking about and we got a chance to steal them away for a little interview! RS: How did you people find the Producer that was right for your album? Powersurge: Guitarist and band leader Nahian was very concerned about the production of the album and we were looking for a producer to work with us in the album. Finding a Producer who would understand our band chemistry was a tough job given that the type of music that Powersurge does but fortunately we came across Nahian's good friend Raef al Hasan Rafa who seemed to be just the right person. Instantly the band decided to ask Rafa to work with us, and he agreed. RS: During the recording process, did you have to face any sort of problems or difficulties? P: We had very little time to finish up the album for a quick release. We didn't even get much time for pre-production. Some of the songwriting processes were even done during the recording sessions. We were determined to produce the heaviest sounding album of Bangladesh both musically and production-wise. So we went through a lot of experiments with Rafa during the recording process to get the sound that we were looking for. RS: How did you people get along composing the music and lyrics? P: We all have a great chemistry. Since we've been in other bands previously, we're all experienced and can work really well together. For the album and its music, we bounced around ideas, improvised on them and with Rafa's help, we carried it all off. Nahian wrote all the lyrics for each song except for 'Han'gor', which Shahan wrote and 'Cancer' by Rafa. RS: Please tell us a bit about the songs in the album. P: Although Powersurge started off as a Thrash Metal band, we wanted to blend some American Metal style Groove and Melody in some of the songs which you will find in songs like 'Shadhinotar Barta', 'Cancer' and 'Shesh Shimana'. In 'Slogan', you'll find a very different Powersurge with acoustic strumming and soft Rock elements. 'Auprostut Juddho', 'Han'gor', 'Agnisnan' and 'Mitther Agrashon' have pure Thrash aggression blended with Groove interludes. The self-titled track 'Powersurge' is a bit different than the others with lots of 80s influenced harmonizes and Heavy Power riffs. RS: Umm…the cover art, what does it exactly signify? P: (Grins) The man on the cover is actually a soldier who has been chained and thrown into a dungeon after he was captured in a sudden war. It's in those moments of solitude that he thinks of his family and his past, when the world had been free of crimes and wars. No one is prepared for a sudden war, that's why our album is named 'Auprostut Juddho'. RS: What is the basic aim of Powersurge? P: The sole motto of Powersurge - to build a firm and solid spot for Thrash metal music in Bangladesh. Now, after achieving the ultimate success in earning a massive number of fans who would never miss a Powersurge show; we have just released our first full-length album 'Auprostut Juddho' and we are very hopeful that the album will create a milestone in the history of Bangladesh making Thrash and Heavy Metal a major part of the Bangladeshi Music. We want to have a 'metallized' Bangladesh! RS: Have you started thinking of the next album yet? P: Well true our first album has just come out, but we plan on getting the next one out within a year or two. We know we have a huge fan base and we don't want to keep them waiting too long so that's why we'd rather not take too much time off. And we do at least 7 to 8 shows per month so that the connection with our fans remains intact. RS: Do you want to say anything to all those die-hard fans of Powersurge that are out there? N.B. Thanks a lot to Nahian Bhaiya and Shafayet for all their help. The world's first wooden supercar has been unveiled, albeit in CG form, and it's faster than a Porsche or a Lamborghini, albeit in performance stats. Called Splinter, the car gets 700bhp from its twin supercharged, 4.6 litre V8 engine - almost 300bhp more than a Porsche 911 GT3. And with a top speed of 240mph, only the Veyron and Aero will beat it. By a small margin. If you own this car, you can have a good laugh at people who feel smug about having wood inserts in the dashboards of their Toyotas. And that too probably fake. This two seater, which is made from a combination of maple, plywood and MDF (yes, same as your furnituyre), weighs 1,134kg - 240kg less than the lightweight Porsche. Joe Harmon, from North Carolina, who is head of the project, said: "Wood has a higher strength-to-weight ratio than aluminium or steel, and it possesses a versatility that makes many types of construction techniques possible. The satisfaction involved in making something from a piece of wood is awesome." The Splinter, which has a roll cage to protect the driver and stiffen the chassis, has a laminated wood veneer chassis and wooden wheel rims. Suspension is provided through laminated wooden arms and springs made from osage orange wood. It is not made from solid chunks of wood, but rather moulded laminates. 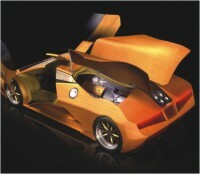 The price for this wooden supercar is yet to be decided. According to Mr Harmon, 27, it might not be long before the Formula One star Lewis Hamilton is behind the wheel of a wooden car. He said: "An F1 car could definitely be made from wood. Some extremely creative engineering would have to go into it to overcome the strength-to-weight and mouldability benefits of carbon fibre, but it's definitely possible.” When you crash into trees does it make you at one with nature? But carbon fibre still has the upperhand. It withstands termites. But one thing is for certain, this is a dream car for termites with the need for speed. Despite everything though, this is an amazing study in engineering. If they can make wood withstand the high levels of stress that a supercar suffers, then just imagine what they can do with other stuff that is inherently much stronger and malleable.